For each day when the ‘Grocery Run’ starts with loading the truck with the kids, gear and dogs; KODA™ provides what you simply demand - high quality multi-tasking workhorse apparel and accessories designed for families to grow outside together. The KODA Adventure Gear™ corporate offices are based in Boise, Idaho. Our team thrives being situated in the rugged Rocky Mountains of Central Idaho. We are surrounded by some of the best hunting from big mountain/big game territory in Challis National Forest to the tortuous paths carved by the Snake River that provide cover to a great assortment of upland birds. Whether we are trying to get in 40 ski days or fill all of our tags or catch our limit, everyone who works at KODA™ is a dedicated outdoorsman (and woman). The only thing more important than our success in the hook and bullet market is spending time with our families; passing down traditions we learned on the banks of north forks, in quiet draws and across miles of ridges. Beginning in the winter sport and outdoor industries over 11+ years ago, the team at Lucky Bums was inspired to bring the diversity of technical fabrics and features found in the ski apparel industry to the hunt industry. We found the “for skiers by skiers” dedication, that is prolific in the ski market, was lacking in the hunting and fishing market. 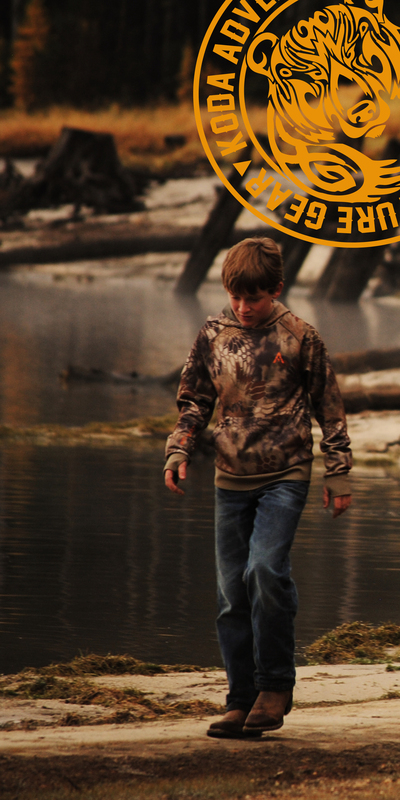 After testing various products for the past 5 years, KODA™ was created to keep us warm on the cold mornings, cool as the day heats up and, amazingly, keeping the kids outfitted for multiple seasons, day after day, and hunt after hunt. Through a rigorous R&D process KODA™ now produces industry-leading hunting apparel systems. Kids apparel features GrowTech™, a small-to-tall feature that allows sleeves and pant legs to extend up to 4” when the stitch is released. Welcome to the KODA Adventure Gear Customer Service page. If you have a question about your order, want to give us your feedback, or just want to talk, feel free to contact us by email, phone, or mail.